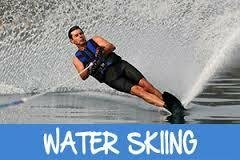 Water skiing is a sport/game and recreational activity and is popular in many countries around the world where appropriate conditions exist - an expanse of water unaffected by wave motion. Rivers, lakes, and sheltered bays are all popular for water skiing. Standard water skis were originally made of wood but now are usually constructed out of fiberglass-based composites. They are of similar length to downhill snow skis but are somewhat wider. Instead of a rigid binding, they have rubber molded binding, in which the skier's feet are placed. Skiers are pulled along by a rope with a handle fitted at one end and attached to a powerboat at the other. Celebrate your Water Skiing birthday party with your best friends out on the water with Planet Boat Club. We provide everything needed for you and your guest to enjoy a party on our new deck boat. Free Boating Safety Course The BoatUS Foundation offers the only FREE online boating safety course developed specifically for your state.